“Shine On You Crazy Diamond” is a nine-part Pink Floyd composition written by Roger Waters, Richard Wright, and David Gilmour. The song is a tribute to former founding band member Syd Barrett, who left the group in 1968 amidst speculations of mental illness which was exacerbated by Barrett’s heavy drug use, although it was not originally explicitly written with him in mind. The song is a part of Floyd’s “Wish You Were Here” and was spilt into two parts that bookend the album. Parts 1–5 of “Shine On You Crazy Diamond” became a staple of Pink Floyd’s live performances from 1987 until 1994. 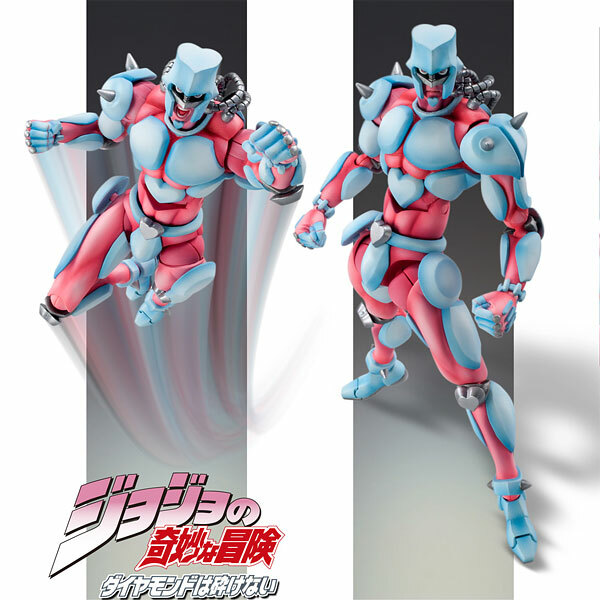 Crazy Diamond is the Stand that is used by the Series Four hero, Josuke Higashikata. Just a little background on Josuke, as he is a major character. Josuke is the illegitimate son of Jospeh Joestar, hero of Series Two and grandfather to hero of Series 3, Jotaro Kujo. Joseph had an affair with Josuke’s mother and never know of Josuke’s existence until Jotaro comes across him while investigating some missing Bow and Arrow’s. Before I get into Crazy Diamonds abilities, I just wanted to talk about the overall design of the Stand. While it’s humanoid in its appearance, which isn’t anything new, Crazy Diamond is really one of the few Stands up until this point to start use symbols in its appearance. If you look at the top of its head, shape of the shoulders, mid torso, belt and knees, there are hearts everywhere. This Stand is capable of repairing damages and healing injuries, often reverting an item back to its original components; ie; reverting a table back into the very lumber it was before, meaning that it can theoretically regress the timeline of an object. This ability allows Crazy Diamond to perform a number of interesting non-offensive tasks, including trapping the enemy, breaking & entering with ease and tracking. However, Crazy Diamond cannot resurrect the dead, Josuke cannot heal his own wounds and if used in a foul mood, the restoration will warp and cause that item to be improperly restored. Crazy Diamond’s ability is this message put to action; restoring what is broken to its former glory. Which make you wonder how much of an influence this song had over the conception of this Stand’s ability. This is a difficult one to assess. While the overall message of the song is amazingly similar to the Stand’s abilities, there are many other aspects of the song that play no part whatsoever. For example, there is quite a bit of technical and instrumental analysis of the song, seeing as this is considered a groundbreaking piece of music. Also The song, as I previously mentioned, is spilt into two parts and used to book end performances; Crazy Diamond as a Stand does not ever deal with technology or the idea of dividing or multiplying itself. It never changes form either. Thus, while the parallels are interesting, I am going to have to credit this reference purely on name alone.